The Life of a LEGEND! The Second Sheriff Of Blackburn Has Arrived! 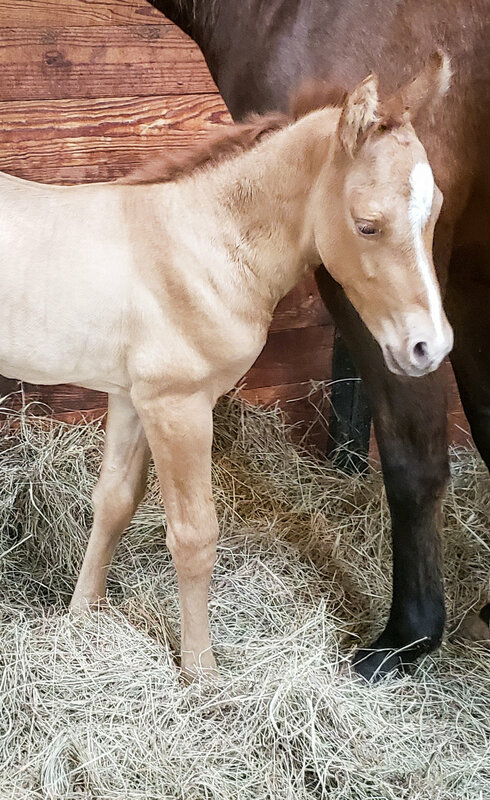 Sheriff of Blackburn’s second foal has arrived (3/18/2019)! A red dun filly out an own daughter of Docs Oak! We are so excited for our clients! The FIRST Sheriff Of Blackburn Foal Has ARRIVED!!! We welcomed Sheriff Of Blackburn’s first foal into the world on February 9th at 2:30am. Flash Em Hooters (AAAT, SI 104, ROM racing, 5x Race Winner) foaled a beautiful red dun stud colt we affectionately named “Streaker”. He is a flashy little guy, complete with wither barring and leg barring! Check out our facebook page www.facebook.com/doublmph for regular updates on Streaker and the rest of the foals that are getting ready to make their way into the world! It was a great honor and privilege to have the opportunity to write about the legendary Mr. Eye Opener. I enjoyed doing the interview as much as writing the article! Visiting with industry veterans is one of my favorite pass-times, this particular occasion afforded me the opportunity to hear numerous stories about greats who once stood at the iconic Belle Mere Farms such as Marthas Six Moons, Easy Jet and of course Mr Eye Opener and Bully Bullion! Thank you Betty Raper for your time during the interview process and CONGRATULATIONS to you and Dee Raper on your induction into the Oklahoma Quarter Horse Hall of Fame, well deserved! BE SURE TO SUBSCRIBE TO OKLAHOMA HORSES MAGAZINE TODAY! Had some tough luck at the Tulsa Holiday Circuit Friday and Today. Saturday we placed 5th and 6th in the class, won 2nd in the jackpot for a little money and won the ABRA Amt. Tie Down roping class. We had fun and learned more and are excited for the next one! Besides rubbing the rope a little, Sheriff worked really good which is what makes it all worth it! 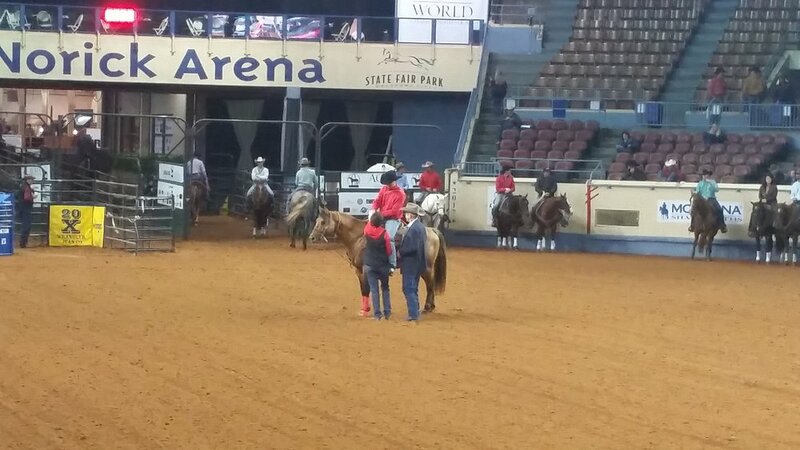 Sheriff Of Blackburn owned by Double M Performance Horses in the Amateur Tie-Down Roping at the Winter Tulsa Holiday Circuit AQHA Show. Sheriff Of Blackburn is Featured in Oklahoma Farm and Ranch Magazine! We are so excited and grateful that Oklahoma Farm and Ranch selected Sheriff of Blackburn for their “Horse Power” section for the Month of January 2019! Sheriff has blessed us in so many ways and we are thankful for the opportunity to get to tell his story! His limited stud book still has a few openings for 2019! Double M Photography Lands the Cover of Oklahoma Horses Magazine! We are so excited to announce that Double M Photography's photo of Dr. Katie Hornberger, DVM, ACT riding her American Quarter Horse Mare, Gospel Grace (aka "Piper") at the amazing Robinson Ranch (Stillwater, OK) was published as the cover of the Oklahoma Horses Magazine for the July/August Issue! This photo was taken as part of a send-off photography shoot of Dr. Hornberger and her husband Jake Hornberger, Katie had just completed a grueling 3 year residency in theriogeniology at Oklahoma State University's Veterinary Teaching Hospital and was preparing for the move to her home state. It was very hot and humid, as most summer shoots are in Oklahoma, but a great time was still had by all. We love capturing your equine forever moments so please contact us today if you're wanting us to capture your special memories! Thank you Dr. Hornberger for letting us capture some of your last moments as an Okie! You are missed but we are glad you're doing so well! 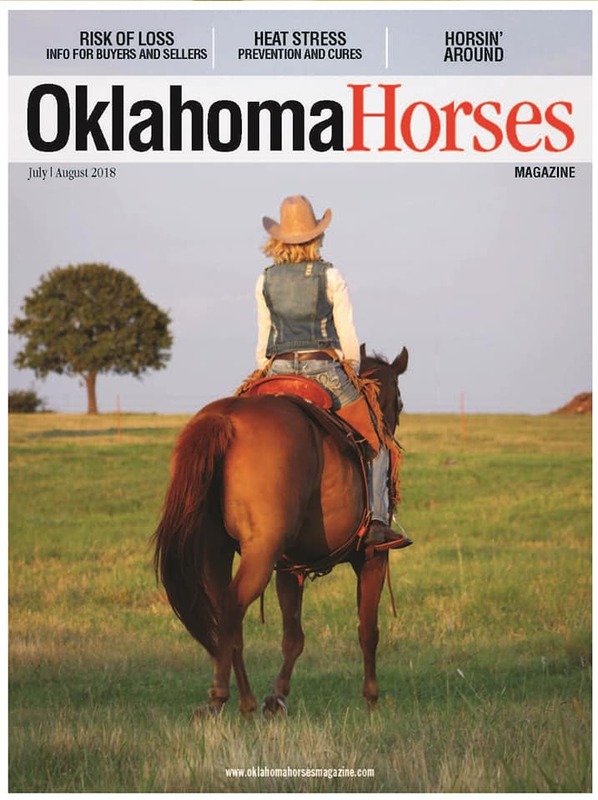 If you're interested in subscribing to Oklahoma Horses Magazine, you can check out their website at www.oklahomahorsesmagazine.com. They keep a running calendar of all things horse related in Oklahoma! They also have a Facebook page so head over and like it! There is also a pdf version of the magazine online you can look at! DivineByDesign (aka "Faith") Makes Her Debut in Barrel Horse News! We couldn't be any more excited that our filly, Faith, made the cut for the "Special Arrivals" section of Barrel Horse News that features the upcoming foals born in 2018! DivineByDesign is by none-other than the great Slick By Design and is out of Ms Gunbattle (Lions Share of Fame X Bailey By Yawl) who is a full sister to WPRA rodeo winner, money earner, futurity money earner and arena record setter, Baileys Dash Ta Fame! We are honored to have our filly grace the pages of our leading industry magazine and we hope it won't be the last time! We are happy to announce all Sheriff Of Blackburn foals will be eligible for the Ranch Horse Futurity! Get them riding around and handy as a two year old, show them in the futurity then start them working cattle or on the barrel pattern as a 3 year old and have them ready to futurity in other disciplines! The best horse is a broke horse! Check out this awesome Ranch Horse Futurity and Stallion Service Auction, you might even find an opportunity to purchase a Sheriff Of Blackburn breeding! They have classes for yearlings (halter and in hand trail) all the way up to 6+ maturity classes. They have a full slate of ranch classes including all cattle classes. This futurity also runs concurrently with their Ranch Horse Spectacular show which is open to all breeds, and is APHA and AQHA approved. They are working to make the Ranch Horse Spectacular a 4 judge APHA and AQHA show. The show itself is August 9-13 in Nampa, Idaho at the Ford Idaho Horse Park. Sheriff Of Blackburn and Mitch Quiring have finished their first ever AQHA World Show as a top 15 finalist, finishing 13th overall. Now we get ready to start all over and prepare for the Tulsa Holiday Classic where Sheriff will compete in the Amateur Tie-Down under Mitch and the Open Senior Tie-Down under World Champion Bradly Boyd! We've received Sheriff's official Coat color test results today! He is Homozygous for the Agouti gene (A/A), Homozygous for the Dun Dilution gene (D/D) and Heterzygous for the the Red Factor Gene (E/e). Agouti Gene: Controls the distribution of black pigment. The dominant allele (A) restricts black pigment to the points of the horse (mane, tail, lower legs and ear rims). As seen, for example, in bays and buckskins. Dun Gene: The Dun gene is a dilution gene that affects both red and black coat color pigments. The gene is associated with "primitive marking" and has the ability to affect the appearance of all black, bay, or chestnut ("red")-based horses to some degree by lightening the base body coat. The dark stripe down the middle of the animal's back is the most recognizable marking associated with Dun horses. Other markings include a tail and mane darker than the body coat and usually darker faces and legs. Red Factor Gene: Horses that are bay, black, grullo, buckskin, black/blue roan, etc. are black pigmented horses that carry at least one copy of the Black Factor (E) allele. The black (E) allele of the extension gene is dominant and causes a black pigmented base both in the heterozygous (Ee) and homozygous (EE) state. A horse that is heterozygous for Red/Black Factor means that it carries one copy of the black allele (E) and one copy of the red allele (e). ****E/e=Heterozygous Extension gene, meaning both black and red factors were detected. He can transmit either E (black) or e (red) to its offspring. The basic color of the horse will be black, bay or brown unless modified by other color modifying genes. Due to his Homozygous Agouti gene he will never throw a brown brown or a black foal. Due to his Homozygous Dun gene, he can and will throw bay duns, Buckskin Duns (dunskins), red duns, palomino duns (dunalinos), Cremello Duns, Perlino Duns, etc.